Rangeley Outdoor Sporting Heritage Museum in Oquossoc, Maine. With thousands of acres of forests, countless lakes and streams, and miles of ocean coastline, Maine is a sportsman’s paradise. The state has a rich tradition of outdoor sporting organizations, competitions, and recreational opportunities. In fact, the outdoor apparel and equipment store L.L. Bean was founded in Freeport, Maine, in the early 1900s by a local outdoorsman whose iconic merchandise is sold around the world. Dive in to Maine’s outdoor sporting culture by hunting, fishing, or learning more about sporting history in a local museum. In the early 1800s, Maine’s economy was dominated by forestry, shipbuilding, and fishing. With the construction of a passenger train railroad network and a later highway network, wealthy families from Boston and the greater New England area began to recognize Maine as a desirable getaway for hunting or fishing. One of the early figures in Maine’s outdoor sporting history is Ed Grant, a guide, fisherman, camp owner, and storyteller who brought sporting tourism to the Kennebago area. Another colorful figure from the early 1900s was Cornelia Thurza Crosby, or “Fly Rod Crosby,” as she was known. Crosby once caught 200 trout in one day, was the first woman to legally shoot a caribou in Maine, and promoted Maine’s outdoor sporting life. One of Fly Rod Crosby’s contemporaries, Carrie Stevens, also became a famous figure across the country because of her superior fly-tying skills. Stevens drew hundreds of fly fishing enthusiasts to the Rangeley Lakes region, and her authentic flies now sell for hundreds of dollars. Another contributor to Maine’s sporting tradition was Herbie Welch, who is today best-known for his Black Ghost streaming fly. Welch was an accomplished taxidermist, painter, sketch artist, and sculptor, depicting many scenes from the Maine wilderness in the early 20th century. These and other outdoor enthusiasts formed the foundation of the Maine sporting tradition that continues today. Over a century ago, Maine residents passionate about its hunting, fishing, and other outdoor opportunities established sporting camps. These traditional camps offer lodging, homecooked meals, and guide services to guests, many of whom return year after year. The Maine Sporting Club Association was formed in 1987 to preserve these camps and continue to provide outdoor opportunities to guests. Whether you prefer a rustic log cabin without running water or electricity, or a luxurious lodge with modern amenities, there is a sporting camp to meet your needs. 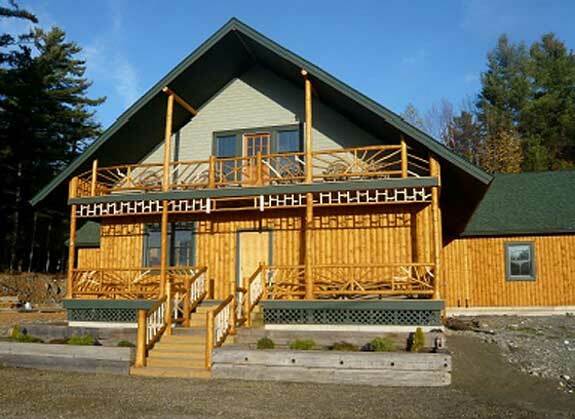 Consider staying in a traditional sporting camp if you are interested in fly fishing, hunting, skiing, viewing wildlife, snowmobiling, hiking, or canoeing. Sporting camps have guides on staff who can help you learn how to tie flies, paddle a canoe, or hunt a moose. When visiting Maine for outdoor sporting activities, it is best to hire a guide who can show you effective techniques, lead you to prime hunting or fishing spots, and prevent you from endangering yourself or others. When looking for a guide, choose a Registered Maine Guide. These guides meet specific criteria set forth by the state of Maine to ensure that they are effective, qualified guides. Fly Rod Crosby became the first Registered Maine Guide in the state due to her fly fishing expertise and outdoor skills, and hundreds of guides have followed in her footsteps. There are five classifications of specialized guide: hunting, fishing, recreational, sea-kayaking, or tide-water fishing. A higher level of certification, Master Guide, requires even more experience. Each Master Guide has at least five years of professional experience in her area of expertise and meets other special requirements. This ensures that only the best guides can brand themselves Master Guides and offer their superior services to others. Many guides are members of the Maine Professional Guides Association, which can help you find a qualified guide in your area. Visit the Maine Professional Guides Association website for more information. For those who are interested in the history of outdoor sporting opportunities in Maine, the Rangeley Outdoor Sporting Heritage Museum is an excellent place to learn more about Maine’s unique sporting history. The 3,500 square foot museum opened its doors in August 2010. The museum contains numerous Maine treasures, housing the largest collection of Carrie Stevens flies, trout mounted by Herb Welch, wilderness paintings and sketches, historic photos of early steamships that served Maine’s lakes, and artifacts from the Native American tribes who first fished and hunted in Maine. The museum also houses excellent specimens and artistic depictions of the brook trout that made the Rangeley Lakes region famous among sporting enthusiasts. The Rangeley Outdoor Sporting Heritage Museum is open from Memorial Day to Columbus Day, coinciding with the peak tourist season. The museum is only open on certain days of the week; visit its website or call 207-864-3091 for more information about hours and availability. 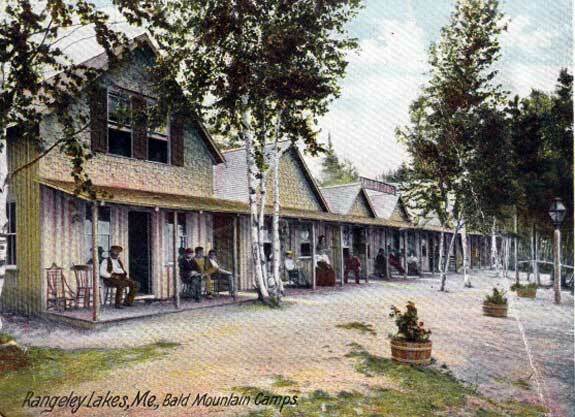 Bald Mountain Sporting Camps on Mooselookmeguntic Lake, Circa 1909.